As most people know I'm an avid collector of all things pop culture related including: comics, toys, lunchboxes, board games, etc., with my other collecting passion being vintage Halloween collectibles. Yes, on occasion, Halloween Boy enjoys discovering a good paper mache jack-o-lantern from the 30s or 40s or tin noise maker meant to drive away evil spirits. Lately though, I've pointed my eBay and Google searches at something a little different and that is using our family surname as my keyword - Janney. It's pretty incredible what I've discovered and eventually purchased over the last few months as shown below. Pictured above are the following items from left-to-right: 1950 Easter merchandise circular from Janney, Semple, Hill and Co., of Minneapolis, MN., a Kenmore Tea box from Janney Coffee Co., of Fredericksburg, Va., 5lb and 2.5lb Janney's Pure Candy boxes courtesy of Janney-Marshall Co., of Fredericksburg, VA and the largest piece, a two-sided Janney Best Paints metal sign that could have been hung outside of a paint store. The only company I've found much info on so far is Janney, Semple, Hill and Co., which was founded in 1866 as a wholesale hardware company out of Minneapolis, MN. 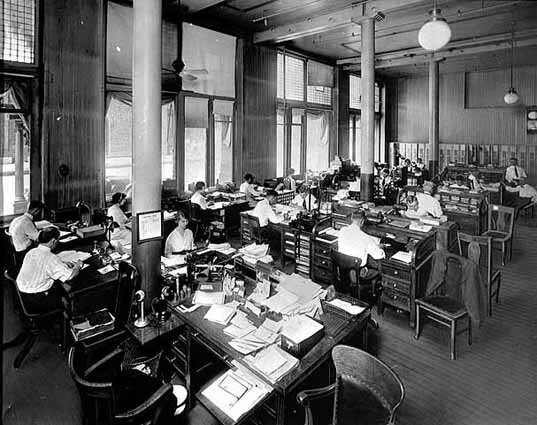 Check out this 1910 office photo courtesy of the Minnesota Historical Society. Finding items from this company are pretty common as they were akin to a Sears, Roebuck and Co., and published numerous catalogs. The one item I'm still keeping an eye out for, and should have snagged when I had the chance on eBay, is the hard-to-find 1953 Janney, Semple, Hill Tonka toy truck. If you see one, please let me know! I'd probably even pay a finder's fee at this point.